When the Texas heat bears down, you probably think about boosting your air conditioning efficiency. Although having a professional maintain your HVAC system is best, you can take several DIY measures to improve your air conditioning efficiency. In fact, inspecting your own HVAC system monthly is necessary to ward off major problems that may develop. Don’t wait until your AC malfunctions and needs extensive repairs. Perform your own preventative maintenance to ensure the system is running smoothly all summer long. Running through a basic checklist can keep your air conditioning unit in excellent working order, enabling you to save money on energy bills. Dirty, obstructed air filters can cause your AC to breakdown. If dirty filters are left in for long periods, this could result in the need for major repairs or replacement. Cleaning the filters throughout your home is easy, and you can check with your HVAC specialist if you need assistance. Clean filters mean improvement in both your AC’s performance and indoor air quality. Ideally, you will want to clean your air filters every month, but the frequency will depend on the type of filter. Follow the manufacturer’s instructions regarding cleaning and replacing filters. Buying a high-efficiency pleated air filter will prolong the life of your air conditioning unit even more. A reduction in your AC’s coolant levels can increase its operating costs, so check these levels often — at least once a month. Even if the coolant levels are too high, the unit’s efficiency can be compromised. Add the right amount of refrigerant, according to the manufacturer’s instructions. Older units typically require R-22, an ozone-depleting chemical that is being eliminated from coolant products. If your AC unit is more than 15 years old, you may have a harder time finding the required coolant. You may want to consider having a newer, energy-efficient air conditioning unit installed. For each degree you lower your thermostat, you save energy. Calibrating and programming your thermostat for the greatest efficiency is important, but cleaning your thermostat is also important. Dirt and dust can accumulate on the thermostat, which can affect temperature readings. If the thermostat has been bumped, the level and calibration may also be off. Your air conditioning system should turn on, run through its cycle, and shut off. If not, the system is not cycling properly and will need professional servicing. A major indicator that your AC isn’t running properly is that the system cycles too fast. In other words, the system turns on and off too often. The issue may be as simple as requiring more refrigerant, but that issue may also be something that requires professional maintenance. Dirt can affect your AC’s condenser and evaporator coils, reducing its energy efficiency. These should be inspected as part of routine maintenance, and cleaned as necessary to prolong the compressor’s life. Your HVAC technician will turn off the power to the condenser, vacuum away any debris, straighten the fins, remove and clean the fan, and spray the fins using moderate water pressure. If your compressor housing receives direct sunlight, consider upgrading your landscaping to include trees or shrubs that can provide shade. These should be at least two to three feet away so that branches or leaves do not affect the unit. Frayed wiring can be a dangerous fire hazard, and repairing such damage will also be a part of your technician’s job. However, you can also play a role by being vigilant, and reporting any problems as soon as possible. Look for improper connections that can affect current flow and voltage, as faulty connections can damage the AC unit. Air conditioner drains and tubing are susceptible to moisture damage, algae buildup, and mold. Water can back up into the unit, resulting in affected humidity levels in your home. Check for any clogged areas that prevent moisture from escaping the system properly. You will want to focus on the base pan and remove any obstructions you find there. Each year, clean your AC’s condensate drain with a mixture of bleach and water to prevent mold and algae. Simply pour the mixture down the drain, and the cleaner should take care of buildup problems. Fans and motors can become sluggish when not properly oiled. Your technician will oil all moving parts to combat this issue. This will also reduce strain on the AC. It is important to focus on the air conditioning compressor, located on the engine block. The compressor is the only moving piece in the system turned by the engine belt. Closing some of your home’s registers and vents may seem like a good way to reduce energy costs, but this practice is actually counterproductive. Closing the vents means the HVAC system has to work harder than necessary, which can result in damage and lead to costly repairs. While you can close vents in an unused part of the house, do not go overboard. Too many closed vents will affect your home’s air distribution and increase pressure. The can result in a restricted duct system, increased duct leakage, freezing on the compressor coil, and increased energy use. Insulation on your refrigerant lines keeps them cool so they can work properly, but insulation tends to break down over time, resulting in damaged or missing pieces. 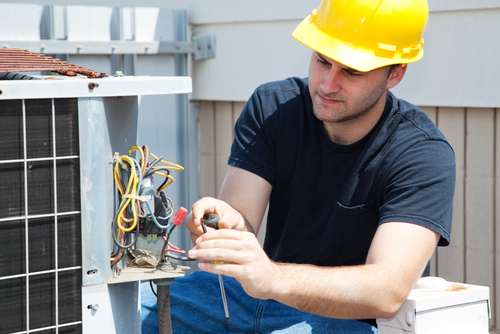 Your technician will also inspect the lines and replace the material when necessary. Foam insulation is best for this project, and cork tap and a utility knife are usually used to cut the insulation to size. You might hear abnormal noises coming from your AC unit. If you are not accustomed to how your AC unit normally sounds, now is a good time to take note. Rattling noises may suggest something has come loose, while whistling sounds can mean the seals are not working properly. Thuds can indicate a fan blade or some other part has come loose, and screeching sounds may mean your belt is wearing out or beginning to stretch. Unusual noises are often the first sign of a major issue. If you hear an unusual noise, turn off your air conditioning system and either try to find the problem yourself or contact a professional. This important maintenance call can prevent further damage to your system. Sticking to your own AC preventative maintenance checklist is the best way to spot problems as they arise, but the checklist itself is not a completely foolproof measure. An annual service check by Conditioned Air Mechanical HVAC Services, can extend your AC system’s life more than any other measure. Some persons opt for two service calls each year — at the beginning of both the cooling and heating seasons. Doing so helps to ensure that your HVAC system is in shape to meet the particular demands of each season. Our technicians are trained to spot even the smallest issues, such as loose or worn parts, and will also clean the fans and coils, check major components, and prevent any problems from becoming worse. Service visits are good time to ask your HVAC technician about easy tasks you should be able to manage, such as changing the filter, but about which you might not be sure. Routine maintenance is necessary for prolonging the life of your system. It is best to schedule preventative maintenance rather than wait until something goes wrong to call a professional. Waiting to make that call could turn out to be more costly in the long run. Following a DIY preventative checklist is also an important part of maintaining your AC system. If you live in the Stafford, Sugar Land, Bellaire, or River Oaks areas, contact Conditioned Air Mechanical HVAC Services at 281-201-0356 for professional, certified service. If you spot any issues with your AC that require immediate attention, we offer 24-hour emergency repairs, including holidays and weekends. We also carry a range of modern and efficient systems. We look forward to improving your home comfort!